The presence of Spanish Colonial horses in America dates back to the 1500s when Spanish explorers brought them to our shores. The Spanish colonies failed but their horses braved the harsh conditions and lived on. They lived by their wits and survived on marsh grass and forage. 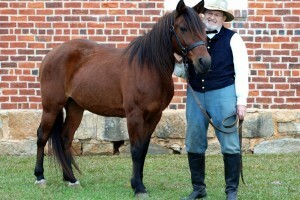 Other Spanish horses made their way to South Carolina through trade routes. In the 1600s English explorers saw Cherokee and Chickasaw Indians riding fine, Spanish horses. Feral Marsh Tackies sought refuge in Lowcountry marshes and were captured and domesticated by Native Americans, European settlers, and African slaves. 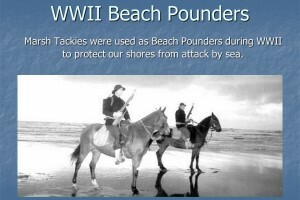 They became the common horse of the area due to their gentle disposition and tough constitution. For centuries, Marsh Tackies were owned by rich and poor alike and were used for everything from carrying children to school, and delivering the mail, to hunting, herding cattle, and plowing fields. Most Gullah families had one or two Marsh Tackies in their yards or tied outside their homes. 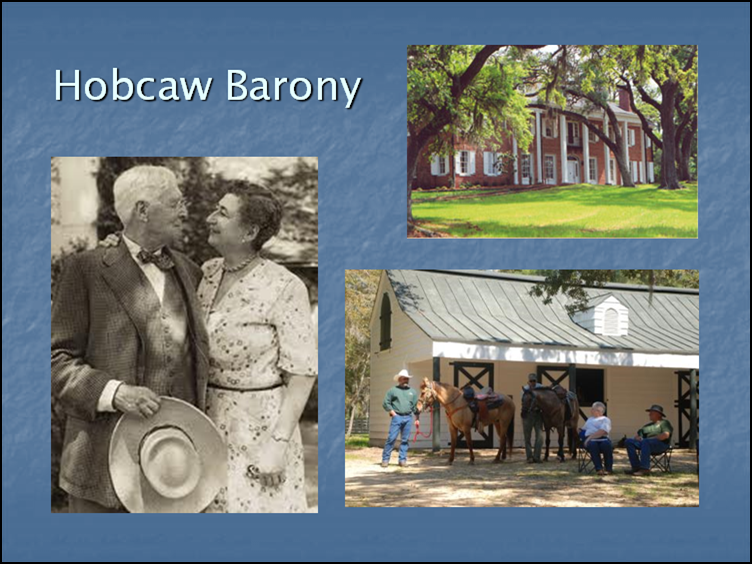 Famous architect, Frank Lloyd Wright, built a special stable just for Marsh Tacky horses when he built the Southern plantation, Auldbrass, in Yemassee, SC. In war times, Marsh Tackies served our southern troops. 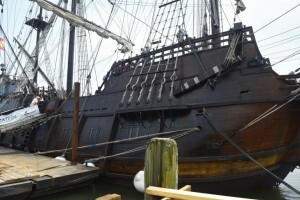 They were used by the legendary Swamp Fox, General Francis Marion and his men, to easily traverse Lowcountry woods and swamps. Marsh Tackies were used by southern troops in the Civil War giving an early advantage to our men who used their own horses in battle unlike northern troops who were issued horses that were unfamiliar to them. 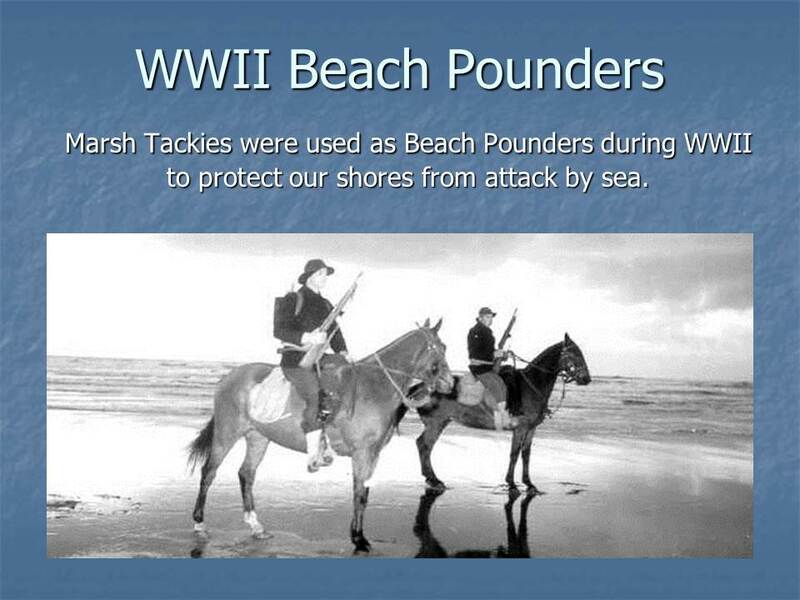 In World War II, Marsh Tackies were used by the US Coast Guard’s beach patrol to search our coasts for Nazi U-boats and enemy activity. During the 1960s and 1970s, and most likely before that time, Marsh Tackies were raced on the beaches of Hilton Head Island. This tradition has recently been revived by the Carolina Marsh Tacky Association. Marsh Tackies range in size from 13.2 to 15 hands and weigh from 700-900 pounds. They have long manes and tails and display most solid colors. Some exhibit primitive markings such as dorsal stripes, and zebra leg striping. In a study conducted by Mississippi State University, it was found that Marsh Tackies have a unique gait that was recently named the Swamp Fox Trot. Marsh Tackies are level-headed, easy keepers that are excellent for farm work, endurance competitions, trail riding, or hunting. Several Marsh Tackies are currently used for revolutionary war and civil war reenactments. A Marsh Tacky named Molly, appeared in the etv film Chasing the Swamp Fox. Molly has been further recognized by being named an honorary member of three South Carolina Daughters of the Revolution chapters. Marsh Tackies were found to have a gait unlike other horses. 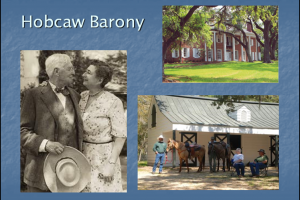 The Carolina Marsh Tacky Association was given the rare opportunity to name the gait. Several suggestions were considered but the winning name was the Swamp Fox Trot.